It's been a busy five weeks since the Bath and West Show. On 4th June at 4.20, Apple Vale Florina delivered a fawn male, Kiku, sired by our stud male, Apple Vale Fortune. Florina often seems to be the dimmest of the herd, but she is a perfect mother - all went smoothly, and he has gained weight steadily - he has a lovely fleece, that is developing nicely, solid colour in the blanket and neck, with a white sock and 'face paint'. Next came the hay-making - our brilliant neighbour, Bas', does this for us, but we have to manually load it and unload it, so a team of young and not-so-young village friends and our son-in-law are assembled to load the trailer, then I drive it over the hill where we unload it into our small barn. With such a large crop this year, we filled the barn completely with no walk-through, and have left stacks in two field shelters. While we have more hay than we would normally use in a year, with the parched grass, we are having to feed much more hay than usual during the summer. As some of the boys' shelter was occupied with hay, we had to erect the gazebo to provide additional shade. Our friends, Mark and Sue Steele have made the bold and exciting move of their home and the Patou herd, to a new farm in Somerset, and I helped move a few of their herd - we wish them all the best in settling in to their fabulous new facilities for them all. A week ago, we welcomed with some relief, our first female cria for three years, Apple Vale Katy, delivered by our fawn dam, Blossom (Reddingvale Valentina), and sired by Apple Vale Fortune. Joy had allowed the females into the garden where there was some reasonable grass to graze, and although the birth was due, there had been no signs during the morning, and while Joy's back was turned, at 2.40, out she popped! Minutes after delivery, Blossom shades Katy from the sun.. The placenta came swiftly after, but Katy wasn't showing interest in suckling - although seven days over her due date, and a good weight at 9.3kg, she was down on her pasterns, and didn't appear to have the strength to stand to suckle - we tried holding her under, and expressed milk from mum's teats, but she still didn't latch on. We thought it may have been the heat (29deg.) sapping her energy - after four hours we decided we had to step in, and de-frosted some plasma, which we intubated directly to her stomach, and got some goat's milk, which we fed her through the night. With this weather, there was no need for a coat, or housing, so we fed her in the paddock at midnight, 3.00am and 6.00am, and continued through the day, resisting feeding too much so that she would have enough hunger to want to suckle, and eventually she suckled un-assisted late in the afternoon, and continued in the evening - we didn't feed overnight, but gave her some milk first thing to make sure she wasn't dehydrating - her legs strengthened and she has continued to make good weight gains daily. 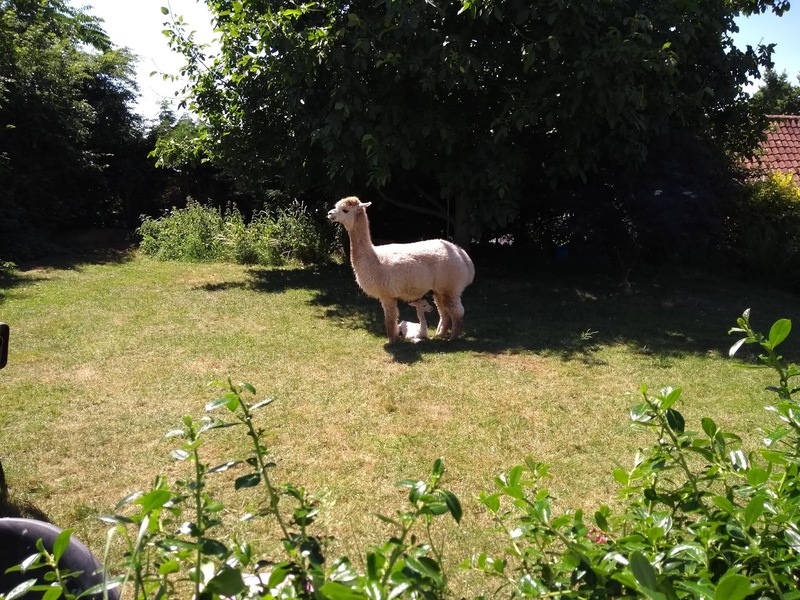 Finally, to relief all round, on friday afternoon our shearer arrived, and together with alpacas from two of our clients, the transformation was made from wooly 'bears' to elegant alpacas. The next trnasformation, will be converting the fleece into desirable, luxurious garments. We have a coouple of weeks respite before more births are due, and we have some re-matings to get on with for those that (frustratingly) didn't carry their pregnancies.